What quality fascinates and entrances me in the photographs I love? I believe it is this: for me, photography in some way captures the Last Judgment; it represents the world as it appears on the last day, the Day of Wrath. It is, of course, not a question of subject matter. I don’t mean that the photographs I love are ones that represent something grave, serious, or even tragic. The photo can show any face, any object, or any event whatever. This is the case with photographers like Mario Dondero and Robert Capa, active journalists who practice what could be called photographic flanerie: walking without any goal and photographing everything that happens. But “everything that happens” – the faces of two women riding bicycles in Scotland, a shop window in Paris is called forth, summoned to appear on Judgment Day. There is one example that shows with absolute clarity how this has been true ever since the history of photography began. The daguerreotype Boulevard du Temple is very well known; it is considered the first photograph in which a human figure appears. The silver plate represents the Boulevard du Temple, photographed by Daguerre from the window of his studio at a busy moment in the middle of the day. The boulevard should be crowded with people and carriages, and yet, because the cameras of the period required an extremely long exposure time, absolutely nothing of this moving mass is visible. 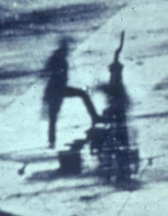 Nothing, that is, except a small black silhouette on the sidewalk in the lower left-hand corner of the photograph. A man stopped to have his shoes shined, and must have stood still for quite a while, with his leg slightly raised to place his foot on the shoeshiner’s stool. I could never have invented a more adequate image of the Last Judgment. The crowd of humans – indeed, all of humanity – is present, but it cannot be seen, because the judgment concerns a single person, a single life: precisely this one and no other. And when has that life, that person, been picked out, captured, and immortalized by the angel of the Last Judgment – who is also the angel of photography? While making the most banal and ordinary gesture, the gesture of having his shoes shined. In the supreme instant, man, each man, is given over forever to his smallest, most everyday gesture. And yet, thanks to the photographic lens, that gesture is now charged with the weight of an entire life; that insignificant or even silly moment collects and condenses in itself the meaning of an entire existence. I believe there is a secret relationship between gesture and photography. The power of the gesture to summon and sum up entire orders of angelic powers resides in the photographic lens and has its locus, its opportune moment, in photography. Walter Benjamin once wrote that Julien Green represented his characters with a gesture charged with destiny, that he fixed them in the irrevocability of an infernal beyond. I believe the hell in question here is a pagan, not Christian one. In Hades, the shades of the dead repeat the same gesture ad infinitum: Ixion turns on his wheel; the Danaides attempt in vain to carry water in a sieve. But this is not a punishment; the pagan shades cannot be equated with the damned. Here, eternal repetition is the cipher of an apokatastasts, the infinite recapitulation of an existence. A good photographer knows how to grasp the eschatological nature of the gesture – without, however, taking anything away from the historicity or singularity of the photographed event. I am thinking of the wartime correspondence between Dondero and Capa, or of’ the photograph of East Berlin taken from the roof of the Reichstag the day before the fall of the Berlin Wall. Or of the (rightly famous) photograph that Dondero took of the nouveau roman authors – Nathalie Sarraute, Samuel Beckett, Claude Simon, Alain Robbe-Grillet – outside the offices of the Editions de Minuit in 1959. All these photographs contain an unmistakable historical index, an indelible date, and yet, thanks to the special power of the gesture, this index now refers to another time, more actual and more urgent that any chronological time. But there is another aspect of the photographs I love that I am compelled to mention. It has to do with a certain exigency: the subject shown in the photo demands something from us. The concept of exigency is particularly important and must not be confused with factual necessity. Even if the person photographed is completely forgotten today, even if his or her name has been erased forever from human memory – or, in- deed, precisely because of this – that person and that face demand their name; they demand not to be forgotten. Dondero once expressed reservations about two photographers he admired; Henri Cartier-Bresson and Sebastiao Salgado. In the first he saw an excess of geometrical construction; in the second an excess of aesthetic perfection. He opposed both of them with his own conception of the human face as a story to be told or a geography to be explored. I feel the same way: the photographic exigency that interpellates us has noth- ing aesthetic about it. It is, rather, a demand for redemption. The photograph is always more than an image: it is the site of a gap, a sublime breach between the sensible and the intelligible, between copy and reality, between a memory and a hope. Christian theologians concerned with the resurrection of the flesh repeatedly asked themselves whether the body would be resuscitated in the condition it happened to be in at the moment of death (perhaps old, bald, missing a leg) or in the integrity of its youth, But they were never able to find a satisfactory answer. Origen cut short these endless discussions by claiming that the resurrection concerns the form of the body, its eidos, rather than the body itself. Photography is, in this sense, a prophecy of the glorious body. It is well known that Proust was obsessed with photography and that he went to great lengths to obtain photographs of the people he loved and admired. In response to his insistent requests for a portrait, one of the boys he had fallen in love with when he was twenty-two years old, Edgar Auber, finally gave one to Proust. On the back of the photograph, Auber wrote, by way of dedication (and in English): Look at my face: my name is Might Have Been; I am also called No More, Too Late, Farewell. A pretentious dedication, certainly, but it perfectly expresses the exigency that animates every photograph and grasps the real that is always in the process of being lost, in order to render it possible once again. Photography demands that we remember all this, and photographs testify to all those lost names, like a Book of Life that the new angel of the apocalypse – the angel of photography- bolds in his hands at the end of all days, that is, every day. Next Next post: What Is It Like to be a Bat?